Does anyone know if you upgrade the speakers and amp from the base system to the Meridian 825w setup including the amp, does the car's software need to be reprogramed by the dealer for the system to work? Does anyone have actual experience with this question? Thanks! Hiyabrad - I'm looking to do the same thing. Did you purchase or install the upgrade yet? Hey Firescrap! Not yet, I really wanted to hear from someone that the dealer is able to do the programming or that the programming is not necessary. I asked my dealer in Hollywood to look into it but they have no info. Do you have any info on the programming side? We're close enough that we should find a dealer to do both. Were you able to install the Meridian Signature sub to the factory amp? How does it sound? I'm interested too.. but want to know where to go for instructions on how to replace the speakers. Ok, I am going to take over this thread as I am taking the plunge. Complaints: Doors rattle from Bass subs in doors. Mids not punchy enough. Distortion of paper above certain volume threshold. Rattles throughout not fixed by dealer even though pointed out many times. Upon receiving all the parts, I am also going to be adding a 200W RMS based amp to power the new 10" Meridian Signature sub as only 50/100w are going there now. Utilize the door sub/speakers less and have some pieces tightened and dynamated inside the door for less rattles. Utilize the amps output to tune the subwoofer under the seat. -Factory 825w only drives small amount of power to woofer, so will not work. -His results sound like a 50-60% improvement over stock and should be tighter bass response than AB. You will not get the ultimate high highs/mids like the AB when playing lossless due to lack of height speakers, the extra 10 we do not have. Total cost with parts and labor should be $2500. Beats trading in my bought new car for someone elses AB. Very interested in doing this to my 17' SC V8 Rover. I spoke with 2 stereo shops around Bellevue WA and told them I was trying to get from my stock system to something more in line with the 825 Meridian system. Both said $8k to $10k to make it happen. While I want a better sound system I am not willing to spend that kind of coin to do so. When I bought my car new just as it arrived from build my dealer warned me of the stock system and being the car had exactly the options I wanted aside from the upgraded sound system I moved forward with purchase. Now I am wanting more and what you guys are doing sounds exactly like what I need to do. I have no issue spending $3k to have someone replace all my existing speakers with better quality if it can yield a notable improvement, especially the non existent base. Any information and parts lists along with instructions off topix you buys would be willing to PM would be greatly appreciated. Very happy to be reading about your positive outcomes. It's a shame that XM is so low in sound quality. It's been my complaint since the beginning. Is the quality if you stream through the phone app any better? Speakers are getting their upgrade. So far, this is the physical comparison of the 825W vs. the 1900W (AB) speakers. Different design and quality for sure. Any update cascade1? Thanks. I installed a RR sub, just looking at some options to power it. I haven’t been on here in a while so let me give you an update. 100% direct. Remove clips, remove screws per speaker, and install new one. Perfect fitment and replacement. Each door took the guys about 5 minutes to disassemble and removing passenger seat etc was around 20 min. Total time to remove all was 1 hour. the amp went into the wheel well by the tire as far as I remember. Very little plumbing needed wiring wise as its a direct shot forward. Dynomat was 15 minutes per door checking all sounds. Pretty straight forward on the process to put everything back to factory (and dealerships forgot some clips and screws, so we added those; go LR). The speakers are super robust and took only 3 days or so to break in. The dynomat was the best part imho and there are 0 rattles. The bass is very deep, like 16 year old kid with two 12’s deep. The subs are all 8” in the doors and under the seat, so they all get a boost it seems from the JL amp. Amp is set to 70% and the sub setting on the Meridian is set to 3/4 with the bass at 0 or half way flat. I am overall really happy with the sound and beyond glad I didnt spend $7k. I am missing the processing, so if you like Vivaldi or just really high end surround sound - $7k is worth it. Bass wise, it outperforms the factory AB. I am comparing against a friends AB car when we played a concert on it. Gone full aftermarket. I thought that factory speakers these days were already great and not like the paper stuff in the 90’s. I was wrong. It’s still a marketing ploy and the quality is not great. The AB speakers were far nicer and close to an entry level aftermarket speaker. They are light enough for the factory amp to move which is nice and don’t distort - they are not paper or plastic, some form of poly it seems. For the price of each OEM speaker, even at discount, I would have gone JL or something like that all around. Would it have been as balanced? I dont know, but from here on out, I will buy the sound system in a car that has good processing capability but not the top of the line one. My 991 has the Burmeister which sounds great up to 70% volume and the processing is amazing, but it craps out after that. It’s the best one they have (also, I cannot hate since its a small cockpit). Finally, always dynomat. Just improves bass response, makes the cabin quieter (for all you OEM DB people deciding to buy the new model because it’s quieter), and just overall more enjoyable. In a nut shell, while speakers have improved in modern day cars OEM, they are still not as powerful as proper aftermarket like a JL. Thats my $.02 of observation. Cheers. Can you help me with the 4 connections to the under-seat sub? 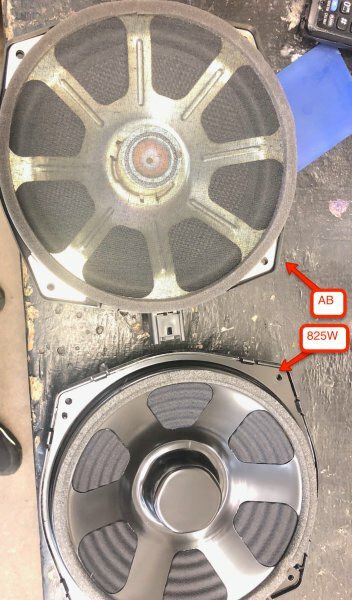 How did you get the JL in the spare wheel area to power the factory sub and get the signal cable form the sub area to the amp? I can route it through the car no problem, it is the connections I need help with to the factory sub. Also, do you have the part number of the upgraded factory sub? Can the 825W Meridian system be retrofitted? Stock Meridian audio or upgrade Meridian? Is Meridian 825W Option Worth It?